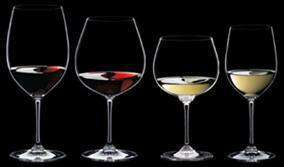 Your Riedel gift - so you can learn to drink correctly! You know how the right jewelry can make or break that lil’ black dress? Well, for all you misguided drinkers who are still (horrors) just grabbing any wine glass for your vino,the same principle holds true. After attending Riedel’s (the Maserati of the wine glass industry) wine reception and tasting (which generously INCLUDES a 4 piece set to take home) your wine tasting life will never be the same. In a unique and fascinating wine and glass tasting, Daniel Vu, Riedel regional sales manager, will demonstrate the relationship between the shape of a glass and our perception and enjoyment of wines. Each boxed set contains one of each of the Vinum Bordeaux, Pinot Noir, Sauvignon Blanc and Montrachet. Riedel is helmed today by Georg Riedel (10th-generation) and Maximilian Riedel (11th-generation), father and son who have revolutionized wine-drinking by their keen mastery of design and understanding of the sensory properties involved in wine-drinking. In 1986, Georg developed the Vinum line of Riedel glasses, the very first varietal-specific machine-blown glasses in the world. In 2004, his son Maximilian broke the mold with his wildly popular stemless “O” glasses. The Riedel company has chosen to host this tasting at Miele, as the glassware is completely dishwasher safe. Both father and son are intimately involved in education on the benefits of varietal-specific glassware, personally educating over 20,000 consumers annually. Our staff would be delighted to speak with you, offering tips for picking out the best glassware for daily drinking, entertaining family and friends, and for enjoying that vintage bottle you’ve been keeping for a special occasion! I look forward to hearing from you, and will follow up soon to discuss this potential story.